WASHINGTON — Local officials are urging motorists to plan ahead for their Tuesday commutes before the expected snowfall. Light rain began falling after sunset Monday night. According to Storm Team 4’s Veronica Johnson, the rain will eventually mix and change over to snow, at least for the northern half of the WTOP listening area. That means most pavement will be wet overnight with some slushy accumulations by dawn. Johnson says the entire region will get some snow, but with temperatures between 32 and 36 degrees on Tuesday, the snow could be heavy and wet. Just before 4 a.m. Tuesday, Metrobus said it would operate regular service. 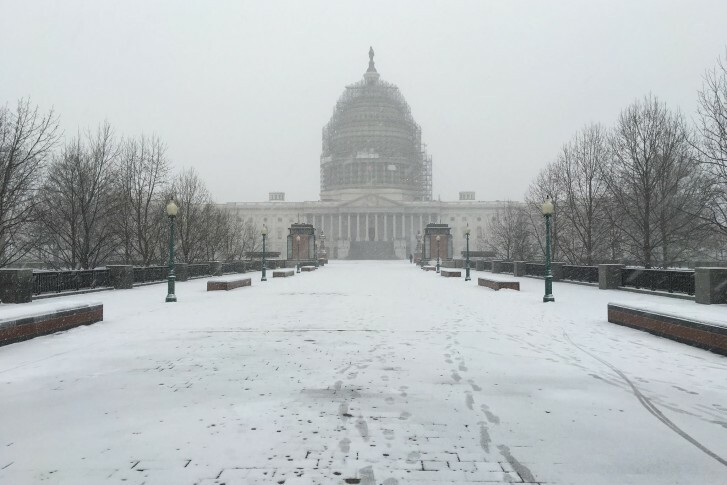 On Monday, WMATA planned to have Metrobus operating under a Moderate Snow Plan. Get the latest updates on Metro’s website. MetroAccess and Metrorail are expected to run on regular weekday schedules. More light snow is possible for the western zones on Wednesday, but it shouldn’t be added accumulation. For the rest of the workweek, though, the region might be dealing with dangerously cold air. Wednesday and Thursday will be fairly breezy, with temperatures in the 30s and wind chills in the teens and 20s. Valentine’s weekend will have highs in the 20s and lows in the single digits in many neighborhoods. The region was blindsided last month; a light blanket of snow hit untreated roads and caused hours of delays for local motorists. Local officials are doing their best to ensure that won’t happen again. “We will have trucks out all [Monday] night and into [Tuesday] to plan for this snow,” says Virginia Department of Transportation spokeswoman Jenni McCord. She adds that it’s a good idea for drivers to start thinking about Tuesday’s commute now. In an interview with WTOP, VDOT spokeswoman Ellen Kamilakis said their 1,400 trucks started working around 7 p.m. Monday. On Monday, State Highway Administration spokesman David Buck told WTOP that crews were out pretreating roads on Sunday ahead of the storm. The pretreatment, he says, is designed to keep the snow loose when it hits the street, making it easier for crews to push it along. Buck says if the storm moves in earlier than expected, it could have a major impact on the roads during rush hour. If possible, he said, leave the office sooner and stay off the roads late Monday night. That would allow crews to treat the roads without much interference. She adds that plows will be deployed until the storm has passed. “Motorists are asked to drive cautiously and, if possible, take public transportation instead of driving,” the statement reads. WTOP’s Neal Augenstein, Marcus J. Moore and The Associated Press contributed to this report.